It’s been a while since we’ve come across a technical skate shoe that draws the majority of it’s innovative construction from a classic running shoe silhouette. But once the New Balance Numeric 420’s photos leaked online, we had to get our hands on a pair to test. The New Balance Numeric skate team has been on a rampage recently from the videos they’ve dropped, and among the team’s heavy hitters like PJ Ladd, Franky Villani, Tom Knox, and Pedro Biagio, stands tech wizard Marquise Henry. Although the New Balance Numeric 420 isn’t Marquise’s pro model, the concept was definitely brought to light with Marquise’s input, and designed by New Balance Numeric’s senior footwear designer Jeff Mikut, who is also killing the color designs that the Numeric footwear line has been releasing. The slogan behind the whole NM 420 campaign is “Highly Skateable”, giving a nod to our skaters favorite April holiday, but also reinforcing the idea that despite the 420 looks exactly like a runner, it was designed for skateboarding and skateboarding only. Lots of companies have tried to make a running shoe inspired silhouette but Marquise Henry and New Balance Numeric team have been the first to succeed in our eyes, read on below and see how the Numeric 420 skated in our 10 hour Weartest. The New Balance Numeric 420 runs a half size bigger, we recommend going a half size smaller than what you usually wear. There are three main aspects of evaluation when we test the durability: the toe area, the mid foot area, and the outsole are the most important sections of the shoe for durability since the all these three parts are connected. Instead of stitching, the NM 420’s toe, midfoot and outsole panels are all fused together which improved the durability of the shoe tremendously as there were no seams to rip during skating. The toe area is also made of combination of mesh and a synthetic material. The synthetic material is positioned in the most crucial side areas all around the toe and the mesh is positioned in the middle where usually no griptape can contact it. As you can see from the pictures, the synthetic material was affected a bit but all in all it holds up very well. Within our 10 hour test, no holes appeared and the shoe would most likely last even longer. The durability of the side in the mid foot area is good. The only drawback was the positioning of the laces and how fast they had ripped. As we mentioned, the third and last aspect of the durability is the outsole. The toe bumper and the side areas of the outsole helped protect the toe area even more and the durability was very good. 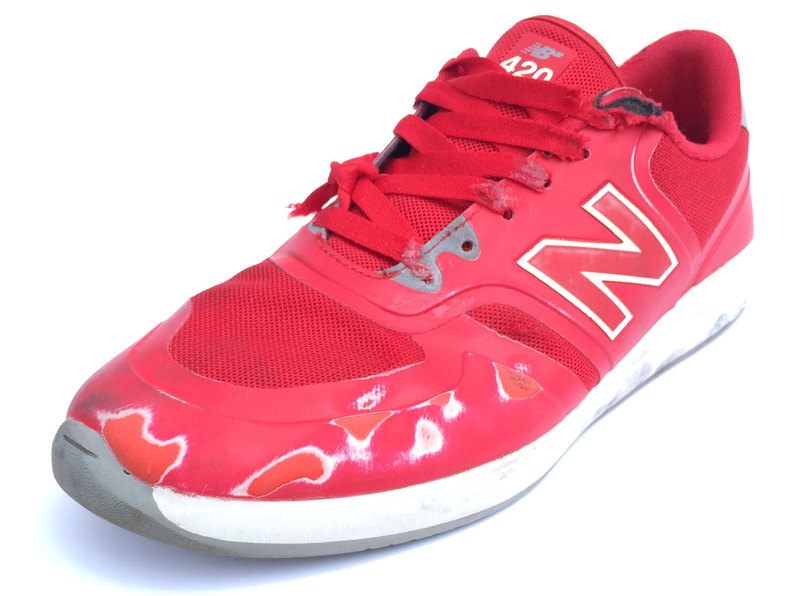 The bottom of the outsole showed very slight signs of wear, so all in all the durability of the NB# 420 was very good. The 420 has a REVlite midsole which is extremely light and provides decent cushioning for impact absorption. The shoe’s main cushioning feature is an EVA midsole, which is a foam composite that tapers from the heel and midfoot area to the toes. Since the toe area is thinner compared the midfoot to the toe, the shoe provides heavier cushioning in the heel and midfoot area and allows for more boardfeel in the front. Just from the look of the shoe, you’ll instantly wonder how the shoe fits and skates. Upon first impression, the shoe felt quite narrow. The shape of the 420 itself feels like it tapers from the midfoot to the toe, only to flatten and round out in the front, instead of becoming a pointed tip. Moreover, the shoe itself looks a bit bulky, but doesn’t feel like that when worn and skated. The heel and midfoot area sits quite snug on the foot but since it’s a running shoe design, the toe area has a lot of space. The mesh that was used in the construction also freeded up a lot of space for the toes as well, this took a bit of time getting used to. The advantage to having a higher toe area is an excellent flick. All in all, the shape of the shoe is different and it took time getting used to, but turned it out to be very good. The boardfeel of the New Balance 420 took barely any time getting used to and in general is very good. As a cupsole model, the midsole in the back two thirds of the shoe proved to be quite stiff and inflexible. However, after a few sessions the whole sole and midsole of the shoe broke in and the boardfeel greatly enhanced. New Balance used a very wide tread pattern for the sole, and it was grippy, with no blow out spots on the sole. Not to mention, the overall outsole of the shoe proved to be durable and grippy. Another highlight of the shoe was it’s stability in the midfoot and heel area. The shoe itself is a snug fit, with a few different factors working together to ensure a tight and compacted fit for the feet. For starters, the shoe’s heel collar sits quite high, which stabilizes the ankle and heel into a deep pocket. The sidewalls of the shoe really highlight the comfort and stability of the shoe; each lateral sidewall is made of an extremely breathable mesh panel that is held up by a seamless construction. The combination of this impressive breathability and the shoe’s stability results in a very stable and comfortable feeling. A drawback of the shoe was the tongue, it was quite thin and not fixed to the upper sidewalls. This resulted in the tongue moving around and also has the tendency to twist around which causes pressure points. The New Balance Numeric 420’s running inspired silhouette may seem unsettling at first, but the skate adapted shoe was full of pleasant surprises. Durability, grip and stability were the highlights of the shoe, while the space in the toe area and the tongue could be improved. For those who are curious, these shoes are definitely worth trying out.